Figure: Human MRP1-specific MAb QCRL-1 (Prod.No. ALX-801-010). 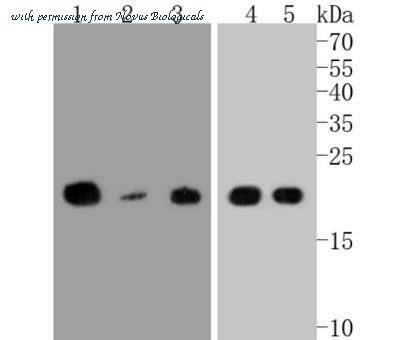 The CD9 antibody from Proteintech is a rabbit polyclonal antibody to a fusion protein of human CD9. This antibody recognizes human antigen. The CD9 antibody has been validated for the following applications: ELISA, WB, FC, IHC analysis. 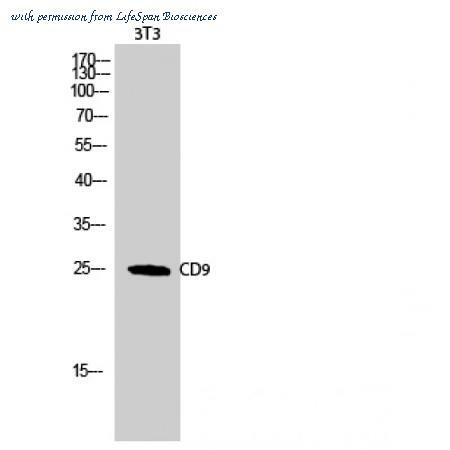 The CD9 antibody from Proteintech is a mouse monoclonal antibody to a fusion protein of human CD9. This antibody recognizes human,mouse,rat antigen. 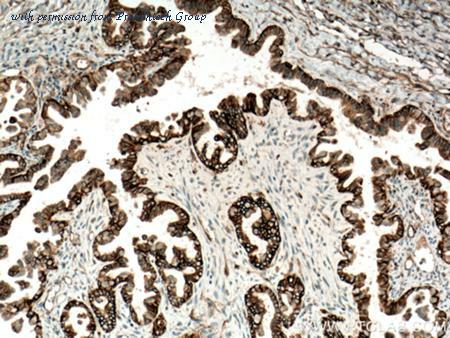 The CD9 antibody has been validated for the following applications: ELISA, IHC, WB analysis. Human platelets stained with purified HI9a, then detected with anti-mouse IgGs FITC. 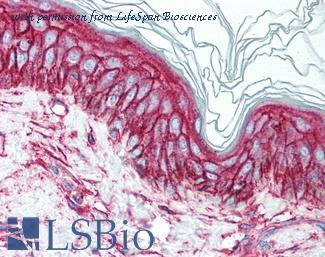 Anti-CD9 antibody IHC of human skin. Immunohistochemistry of formalin-fixed, paraffin-embedded tissue after heat-induced antigen retrieval. Antibody concentration 10 ug/ml. 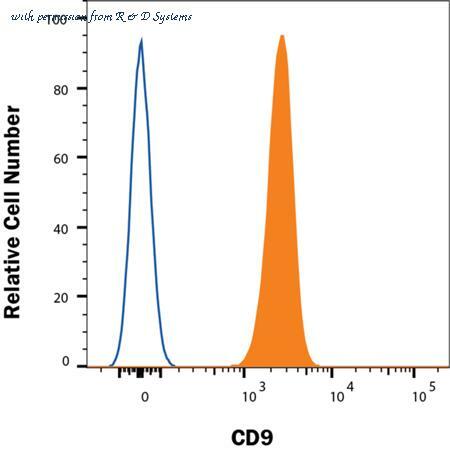 Detection of CD9 in Human Platelets by Flow Cytometry. 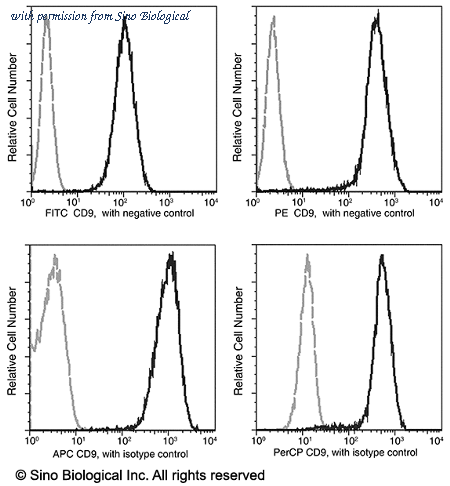 Human peripheral blood platelets were stained with Mouse Anti-Human CD9 Monoclonal Antibody (Catalog # MAB1880, filled histogram) or isotype control antibody (Catalog # MAB0041, open histogram) followed by anti-Mouse IgG PE-conjugated Secondary Antibody (Catalog # F0102B ). View our protocol for Staining Membrane-associated Proteins . 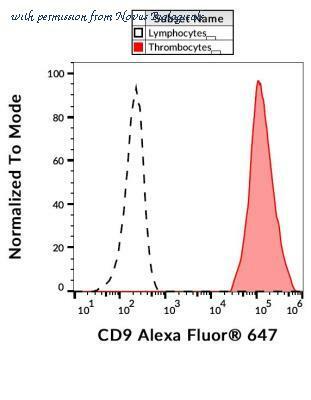 Detection of CD9 in Human Platelets by Flow Cytometry. 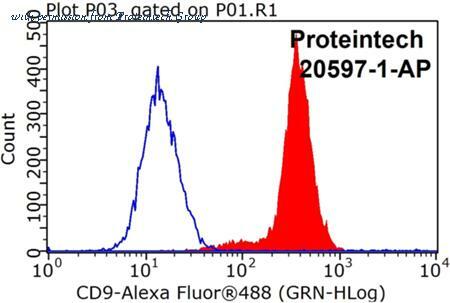 Human peripheral blood platelets were stained with Mouse Anti-Human CD9 Fluorescein-conjugated Monoclonal Antibody (Catalog # FAB1880F, filled histogram) or isotype control antibody (Catalog # IC0041F, open histogram). View our protocol for Staining Membrane-associated Proteins . Detection of CD9 in Human Peripheral Blood Platelets by Flow Cytometry. Human peripheral blood platelets were stained with Mouse Anti-Human CD9 PE-conjugated Monoclonal Antibody (Catalog # FAB1880P, filled histogram) or isotype control antibody (Catalog # IC0041P, open histogram). View our protocol for Staining Membrane-associated Proteins . 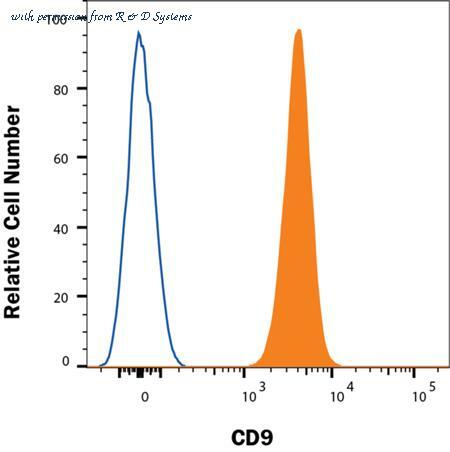 Flow cytometric analysis of Rsc96 cell using CD9 antibody. 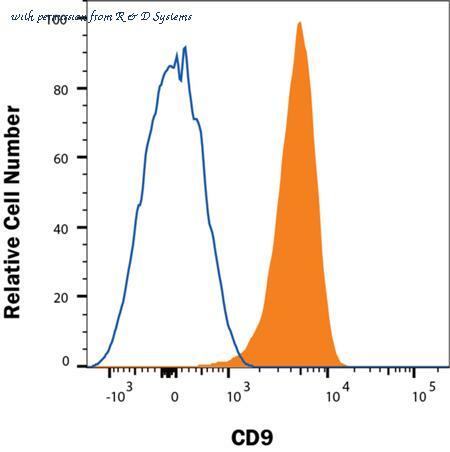 Flow cytometric analysis of Raji cell using CD9 antibody. 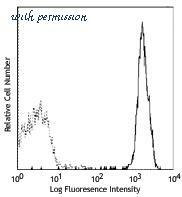 Flow cytometric analysis of Mouse spleen cell using CD9 antibody. Profile of anti-CD9 reactivity on HeLa cells analyzed by flow cytometry. 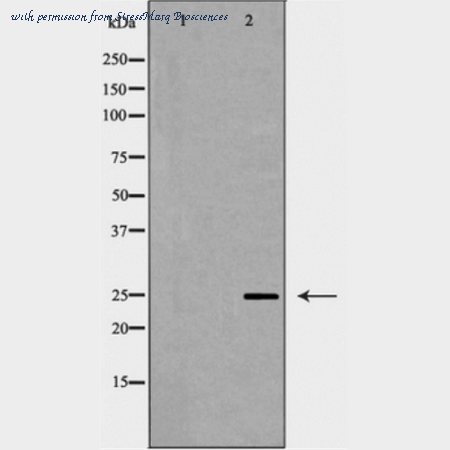 Western blot analysis of Human COLO cell lysates showing detection of ~25 kDa CD9 protein using Rabbit Anti-CD9 Polyclonal Antibody (SPC-1272). Lane 1: Human COLO cell lysates incubated with the immunizing peptide. Lane 2: Human COLO cell lysates. Primary Antibody: Rabbit Anti-CD9 Polyclonal Antibody (SPC-1272) at 1:1000. Predicted/Observed Size: ~25 kDa. Western Blot: CD9 Antibody (5G6) [NBP2-22187] - Analysis using CD9 mAb against HEK293 (1) and CD9(AA: 37-228)-hIgGFc transfected HEK293 (2) cell lysate. Flow Cytometry: CD9 Antibody (MEM-61) [NB500-327] - Surface staining of human peripheral blood with anti-CD9 (MEM-61) Pacific BlueTM.